When the back story is the thing! Novice writers often have big stories to tell. Most of the time, when I first begin working with a writer who is working on their first big project, they have trouble with the details. What is the right amount of detail? How much background do I give? How can I tell the reader why a certain situation is important to the character without telling his or her whole life story? When is it important to add that in, and how much? As writers we know who our characters are. Whether we have taken the time to write out a character sketch, and give them a written background and personality traits, we know them. We have figured out their sensitivities, quirks, likes and dislikes. Sometimes it’s not a character we are writing. Sometimes we are writing our own experiences and we, of course, know our background and why something is important to us. If we don’t share these motivations with our readers, our words are hollow and without resonance. Our characters become one dimensional and our readers can predict what they will say or do. This is not the way to keep a reader engaged! Let’s take a look at a short paragraph and see how it might benefit from some back story! Alex was raised in an apartment with 8 siblings. There was no room for anyone in the house to stretch out or move about freely. He had to share a single bunk bed with two older brothers who regularly squished him between them while they slept. As an adult, Alex found that he had developed a terrible aversion to small spaces and would have anxiety attacks if he had to spend too much time in one. Okay, now we get it, but we can’t fit his entire story into this paragraph, can we? Not if we want Alex to stay in the moment with his date, which, in this case we do. So how do we do it? The key is to use small details that tell large amounts of the story. Let’s give it a try. Now we have enough back story to inform the scene. We invite the reader to have a look inside Alex’s mind and past so that they can have greater understanding and empathy for him. Now we know why it’s so hard for him to be in such a small space! In fact, now we are concerned that it’s going to get worse, that Alex’s past will make it impossible for him to stay in that small room and ruin his date. By using back story judiciously, we give the reader a further reason to engage fully with our characters. We include them in what’s at stake, and make our characters and the situations in which they find themselves, more real, more haunting and more relatable to our readers! 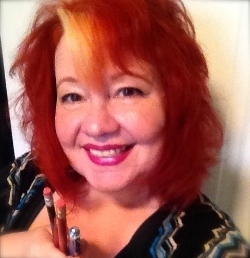 Cheri L. R. Taylor holds a Masters of Fine Arts in Writing from Vermont College and is currently a writing instructor at Macomb College. She has facilitated writing workshops with the Arts in the Spirit Program at Oakwood Hospital and as a Writer in Residence with the Inside Out Literary Arts Project conducting writing workshops in the Detroit Public Schools. She has four chapbooks of poetry and has been published in Ellipsis, Awakenings Review, The CaféReview, Reintigration Today, Clean Sheets, Current Magazine, Rattle, Third Wednesday, Strange Michigan, Jezebel, Love Notes, An Anthology and others. Her book of poems, Wolf Maiden Moon was released from Pudding House Press in 2010. She recently released her first novel, Leaving Walloon to positive reviews. Leaving Walloon is currently under consideration to become a motion picture. Cheri also hosts her own weekly radio show on A2zen.fm, Creative Energy in YOU, Wednesdays at 7 p.m. Eastern, which is dedicated to teaching people how to enjoy creative energy, and joyful writing in their lives!